"What you do makes this happen! These children have grown leaps and bounds since we incorporated KAH food. The regular rice & veggies didn't do the same!" This quote was taken from a thank you we received from Empowering Haitian Moms. Another full shipment to Haiti is leaving the warehouse next week so these children can continue to grow strong and healthy. This summer we are celebrating our 5th anniversary. As is typical when marking a milestone we tend to look back and remember and look forward and plan. Over the past 5 years you have packed more than 5 million meals. FIVE MILLION MEALS! We have shipped meals to areas devastated by natural disasters, disease and poverty. Thousands and thousands of children and their families have had a hot meal prepared from one of our packages. 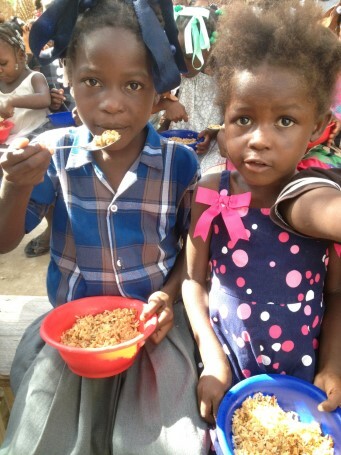 Children from San Joaquin and Stanislaus Counties, Haiti, the Philippines, Somalia, Kenya, Liberia and soon Nepal have been fed by shipments from our warehouse. Looking forward we expect 2015 to be a record breaking year. You have already packed over 750,000 meals and the second half of the year usually has more activity. Thank you for all you’ve done and given to support KAH Bay Area the past 5 years and for your anticipated support as we continue to fight hunger around the world.